The British School in Colombo, launched their Teaching with Technology Program at a prestigious event with fellow educationalists. The program includes adoption of the Microsoft Office 365 based LMS, LP+365 enabling more immersive learning methods. 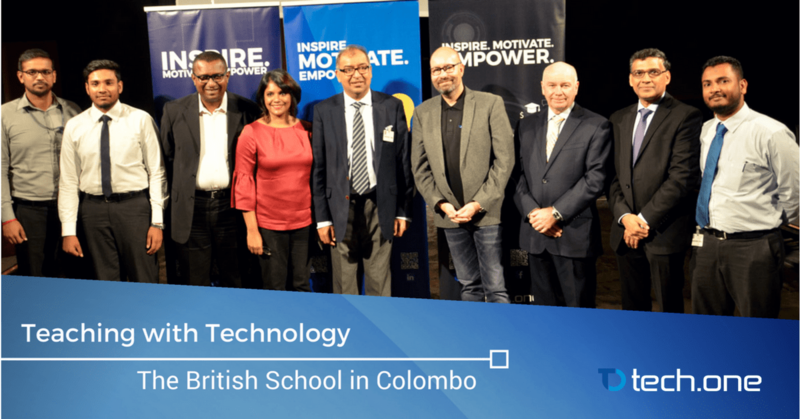 Colombo, 24th March 2017 – For the first time in Sri Lanka, the prestigious British School in Colombo embarks on the wave of digital transformation in partnership with Tech One Global, Microsoft, and Learning Possibilities. The British School in Colombo is a progressive International School establishing the concept of creative, collaborative, and transformative learning with the use of cutting-edge technologies. In January 2017, the school piloted the market-leading Learning Management System (LMS) LP+365 with the aid of Tech One’s support, training, and implementation program. Today, the school launched the use of the technology in a prestigious event. Fellow educators and government representatives were invited to see the journey of the students and teachers in the adoption of these technologies. Microsoft, together with the CEOs of both Tech One Global and Learning Possibilities addressed the attendees with inspiring speeches. LP+365 was developed in partnership by Learning Possibilities, the providers of the All Wales National Learning Platform and Microsoft to transform the education market in Asia. It is hosted on the Microsoft Azure cloud and transforms Microsoft Office 365 into an education focused collaborative and creative learning tool. “Microsoft and their partner products are used globally within education, businesses, and governments. To be able to teach and for our students to learn using market-leading tools that will build skills only to help them in future employment is crucial. Tech One Global has been an active partner throughout the process to provide the best learning experience for the students and the staff at the British School in Colombo while setting an example and making history to change the learning environment for the students in Sri Lanka. They are proud to say that The British school in Colombo is the first step to drive digital transformation throughout Sri Lanka to provide the best learning experiences for the students and teachers around the nation. As mentioned by Tech One Global, their mission is to inspire, motivate and empower the students around the world and empower the future generations to innovate and be creative. LP+365 is the most advanced LMS built on Office 365. The solution fully utilizes the power of Office 365 and will give schools an education focused and effective learning platform delivering the LP+Adopt pedagogy, and features and functionality of the LP+4 platform.